THE ULTIMATE 22" KETTLE ACCESSORY BARBEQUE TOOL YOU DIDN'T EVEN KNOW YOU NEEDED! The Upper Deck provides a large, second tier grilling, smoking and warming surface to your 22 inch charcoal grill. With its unique, open-face design you have full use of the lower grate, expanding your cooking area by nearly 50%. Our elevated grate can be positioned anywhere within the kettle and is designed to allow you to cook with the lid on or off to meet all of your outdoor cooking needs. Don't be surprised if you quickly realize this is one of the best grilling accessories you ever purchased. So go ahead. Add that extra rack of ribs, grill at a slightly lower temperature or keep your food warm! INCREASE YOUR COOKING AREA- Kettle Kommander is now Grillvana! Patented (US Patent # US D822 436 S) expansion rack adds nearly half of a full grate to your 22" charcoal grill. Great for grilling, smoking and warming anything like buns, meats and veggies. Perfect for an indirect slow grill or providing distance between a direct flame or sear. 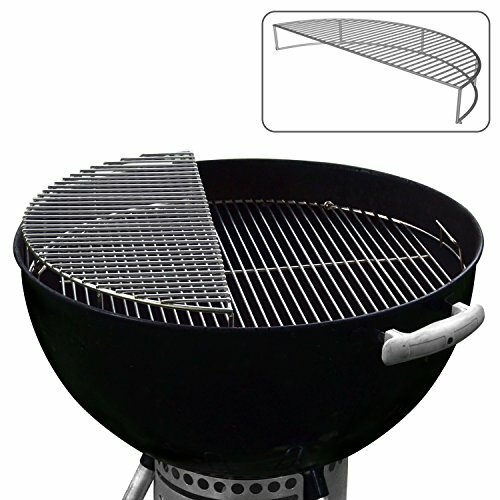 FUNCTIONAL, SIMPLE TO USE- The open-front grill rack is made to sit around the perimeter of your regular 22 inch grill grate and does not reduce lower cooking area space. Also works with 22 inch hinged grates to add the addition of briquettes. Lid can be fully closed with food on top of rack in most cases. NO RUST, EASY-TO-CLEAN QUALITY CONSTRUCTION- Made of heavy duty 201 stainless steel to provide years of use. The Upper Deck is virtually rust proof which means no more grilling with rusty grids and no corrosion! Did you also know stainless steel is much easier to clean than chrome? Spend more time chillin' and grillin' than cleaning. VERSATILE, MUST-HAVE GRILLING ACCESSORY- Don't take our word for it, check out the reviews from grillers around the country just like you. Invented by a Weber grilling enthusiast to add a warming rack as seen in gas grills, he quickly realized this rack became an essential, everyday barbecue accessory allowing different types of cooking. RISK FREE INVESTMENT IN YOUR GRILLING FUTURE - Yes, there is such a thing as risk free! We understand our grates costs more. We also know there are serious carnivores looking for a long-lasting, quality product they'll be using for years to come. If you have any issues with your grate at any time, send us a message and we will send you a replacement or refund. If you have any questions about this product by Grillvana, contact us by completing and submitting the form below. If you are looking for a specif part number, please include it with your message.